Julie Kronenberg holds a photo of her dancing with her grandfather, Jacob Hennenberg, a Holocaust survivor during a 2001 Kol Israel dinner held in honor of him. Behind her are several of her grandfather’s paintings, and the Beachwood house in which she now lives was once her grandparents’ home. Three months after Elie Wiesel’s death July 2, these powerful words – taken from his book, “Night,” his memoir of horrors he witnessed as a teenager during the Holocaust – carry a little more weight than they used to. An Auschwitz survivor and Nobel Laureate, Wiesel was a vocal advocate for not letting the atrocities millions of Jews experienced at the hands of Nazis during World War II fade from memory – and he was arguably the most prominent. After all, “Night” has educated generations of American children about the Holocaust since it was published in English in 1960 and included in middle- and high-school lesson plans across the country. His passing served as a stark reminder that the number of Holocaust survivors left, including here in Northeast Ohio, is dwindling. However, their legacies live on through their children, and increasingly, through their grandchildren, so-called third-generation survivors, most of whom are millennials or members of Generation X. As the last remaining eyewitnesses to the Holocaust depart, this next generation works to keep Holocaust remembrance at the forefront in the 21st century. Julie Kronenberg’s love for her grandfather, Jacob Hennenberg, is evident. After moving back to Cleveland from New York a couple of years ago, Kronenberg, 33, purchased her grandfather’s home in Beachwood, where she now lives with her husband, David, and their two young daughters, Lily and Hannah. 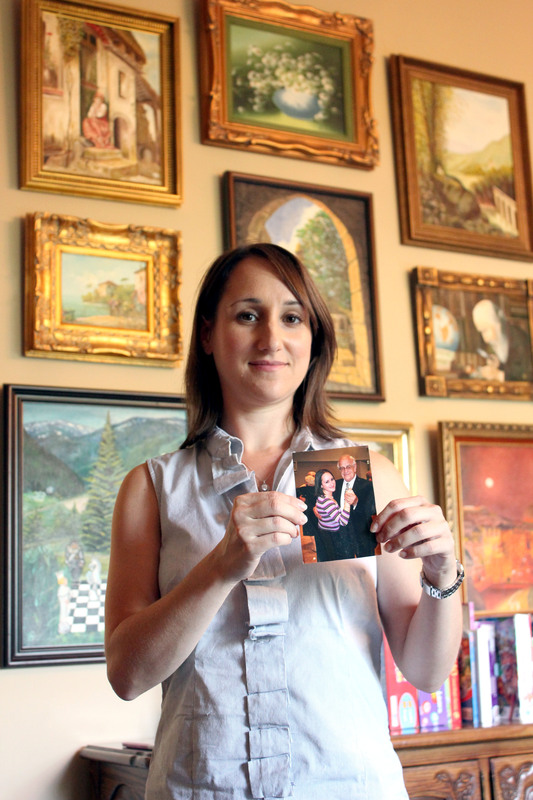 Her walls are decorated with her grandfather’s paintings, which depict memories of his life. And a large wooden bookcase is filled with Hennenberg’s books and dozens of binders that hold letters, postcards and artifacts he collected after World War II. The strong sense of pride she has for her grandfather can be felt as she points out his artwork and smiles as she recalls past memories of him. Hennenberg, who died May 22, 2014, was born in Oswiecim, Poland. He was 15 years old when the war started and was sent to various forced labor camps and concentration camps. He and his sister were the only two from his immediate family to survive the Holocaust. Following the war, he left Poland for Germany, where he met his wife, Hilda. The couple moved to America in 1949. Hennenberg talked openly about his experiences with Kronenberg, and always tried to cast them in a positive light. In Cleveland, Hennenberg served as a historian for the Kol Israel Foundation, a nonprofit organization of Jewish Holocaust survivors, their families and supporters, and designed the Tree of Life relief sculpture inside Congregation Shaarey Tikvah in Beachwood in memory of those whose lives were cut short by the Holocaust. He also was a prolific writer, and asked Kronenberg to type up many of the stories he had written in order to preserve them. Kronenberg’s personal connection to her grandfather drives her to keep memories of the Holocaust alive. She’s spoken at the Maltz Museum of Jewish Heritage in Beachwood about her grandfather’s story and hopes to become more involved with Face to Face, a Holocaust educational program at Shaarey Tikvah. She’s also creating a memoir that details her grandfather’s life story. “Thankfully, we still have survivors to tell their own stories, but pretty soon we won’t. The next generations will have to step up to the plate and share the stories of people they knew and of their loved ones because there won’t be anyone else to tell those stories,” she says. Like other third-generation survivors, Kronenberg embraces the digital age in how she remembers the Holocaust. Her father created jacobhennenberg.com about eight years ago. Kronenberg now keeps it up to date with photos of her grandfather, images of his paintings and other artwork, and videos of him speaking at various Holocaust-related events. Kol Israel Foundation Executive Director Hallie Duchon shares a family photo from 1975 that shows her grandfather, Holocaust survivor George Schoenberg, surrounded by his grandchildren, from left, 6-year-old Ross Glick, 3-year-old Hallie and 1-year-old Corey Glick Fox. While some Holocaust survivors speak openly about their experiences, others keep them private. Such was the case with Hallie Duchon’s maternal grandparents. Her grandmother, Regina Schoenberg, was born in Ciechanów, Poland, in 1916. She was sent to Auschwitz and was the only one out of her seven siblings to survive. She died in 1958 of a brain aneurysm. 18 months in Auschwitz. He was eventually put on a death march with 500 Jewish people and was one of only 31 to survive. He was liberated in May 1945. Of his three siblings, he was the only one to survive. Regina and George met after the war and married in 1945. Together with Regina’s cousin, they hitchhiked across borders into Germany. Regina urged George to relocate to Cleveland, since she had family here. They immigrated to America in 1948, and after a year of George working two jobs, they had saved enough money to purchase their own home. Duchon, a member of Temple Emanu El in Orange, says that as a child, she didn’t understand the scope of what her grandparents lived through. After college, Duchon began researching her family history, reading books and watching movies about the Holocaust, and speaking with survivors. She also became involved with the Kol Israel Foundation, of which her grandfather served as a founding member. Although she didn’t have many conversations with her grandparents about the Holocaust, she feels it still had a strong impact on her life. “My mother being second-generation, she was raised so differently than other people I know whose parents were not in the Holocaust. We were always told, ‘you’re strong, this is where you come from, don’t give up.’ That’s how I was raised, and that’s how I feel toward my children, too,” she says. Duchon takes pride in passing on these lessons to her children – something she suggests other third-generation survivors can do since they’re now of the age where their sons and daughters are old enough to understand. Duchon says her children are starting to ask more questions about their ancestors and heritage as they grow older. For Jake’s bar mitzvah this year, he did a twinning to pay homage to a Jewish boy who perished during the Holocaust and was never able to be a bar mitzvah. Duchon recently witnessed firsthand how her grandparents’ experiences are shaping her children’s lives. During the first week of school at Solon Middle School, Marlee’s teacher asked the students to write down the 10 most important things they wanted other people to know about them. 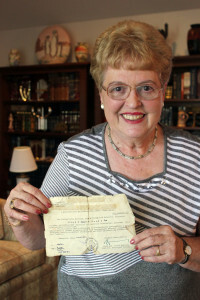 Eva Kahana, a Holocaust survivor and Case Western Reserve University professor, shares a Swedish Schutz-Pass, meant to protect Jews during the Holocaust, in the living room of her University Heights home. As a distinguished sociology professor at Case Western Reserve University in Cleveland, Eva Kahana begins her “sociology of stress and coping” class the same way each year. On the first day, she asks each student to state his or her interests. When it’s her turn, Kahana shares that she is a child survivor of the Holocaust. More specifically, then-3-year-old Eva and her mother survived because they were hidden in the “cold, damp” basement of a Protestant church. Her father, who had been sent to a slave labor camp, was just one of three people who survived and returned home. “When I teach about stress and coping, it’s from the vantage point of someone who actually almost didn’t survive,” says Kahana, 75, who now lives in University Heights with her husband, Boaz. Being on a college campus gives Kahana the chance to share her story as an eyewitness to the atrocities of the Holocaust with a younger generation. She views teaching as a way to carry on the lessons of the Holocaust. “As a Holocaust survivor, I was taught from a very early age that I stayed alive and that I will have to make up for all the people who didn’t stay alive, and that what I do in my life and what I do with my life is a big responsibility,” Kahana says. Kahana was born in Budapest, Hungary, in 1941. She and her family left Hungary in 1956 and spent eight months in Austria before immigrating to America in 1957. She married in 1962 and had two sons, Jeffrey and Michael. Passing on the value of doing good and making a difference in the world is important to Kahana. 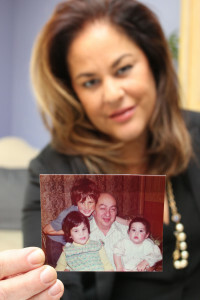 It’s something she believes she achieved with her two sons, and she hopes her seven grandchildren will learn the same. “The real question is, how do we make sure that the kids we are raising today are going to resist any hatred toward other groups. Each person, Jewish or non-Jewish, is responsible to instill those ideals in their children,” she says. Being a professor and working with millennials on a daily basis provides Kahana a unique vantage point. She feels a connection to all minority groups, and was recently identified as an ally to the LGBT student body at CWRU. But being on campus also gives Kahana insight into the challenges facing this next generation. Kahana feels the Holocaust is no longer seen as a major issue among millennials, which she calls a “real crisis.” Giving lectures on the Holocaust is one thing, but she believes more work must be done. She also feels that the voice of the Jews as a people is being diminished, and worries whether millennials will develop a strong Jewish identity they can be proud of. As the newly named executive director of the Kol Israel Foundation, Duchon says one of her main goals is to grow the number of third-generation survivors within the organization. She hopes to do this by creating events and programs that are more appealing to millennials, like meet-and-greets with authors or screening films on the Holocaust. Duchon sees many existing opportunities in Northeast Ohio for third-generation survivors to get involved, whether through fundraising to support various programs or volunteering their time. She also thinks there are opportunities for co-sponsorships with some of the Jewish institutions in the community, such as the Jewish Federation of Cleveland or the Maltz Museum. Educating the next generation is key, she says. With help from volunteers, Kol Israel has taped the testimonies of four Holocaust survivors. The videos have been shown to students within the Bedford School District and at Temple Emanu El, among other institutions. Duchon hopes to show the videos to more schools, including private Catholic schools. Now is a crucial time for third-generation survivors to become more involved, Duchon says, since many of the hot topics in the country revolve around bullying and hatred. She noted that as the number of remaining Holocaust survivors goes down, anti-Semitism is on the rise globally. “I feel like there are people now coming out from everywhere trying to make a difference because it’s such an important topic. I think people are realizing you can’t just stand by, you have to do something,” she says. It’s important to Kahana to see Holocaust remembrance carried on by future generations – something she knows will take action and commitment. Young people learn by example, which is why Kahana believes it’s crucial for parents and synagogues to play a role, whether it’s teaching a child Hebrew or welcoming all types of families at a congregation. She also sees opportunities for Jewish millennials to find careers that allow them to make a difference. “Maybe if millennials understand that we’re all in this together and it’s not just our past but it’s their children’s future that’s at stake, it’ll make a difference. You can remember the Holocaust and live life with gusto. Remembering the Holocaust to me is about remembering your identity,” Kahana says. Duchon hopes to see more third-generation survivors become involved in organizations like Kol Israel and attend community events related to the Holocaust. She also encourages people to utilize their skill sets. “Everyone has something different to bring to the table,” she says. “If someone’s a teacher, they can bring their knowledge. If someone works for a corporation, they can talk about the best way to infiltrate corporations for fundraising. While much of Kronenberg’s efforts are self-motivated, she sees a need for Jewish institutions to lead the drive in creating more opportunities for millennials to get involved. The Jewish community in Cleveland is doing a great job when it comes to this, she says, but more work can always be done. Third-generation survivors are taking the initiative on Holocaust remembrance and educate – whether for fellow millennials and Gen Xers or for the next generation – in ways that make sense for them. By planning community events, participating in outreach efforts, or as in Kronenberg’s case, sharing family stories, they’re increasingly establishing that Holocaust remembrance is imperative to the community. “Very few people growing up in America today have been through something as horrific as what my grandfather went through,” Kronenberg says. “His perspective on the world, I think, is important to remember. He could still think people are generally good and have hope for humanity, faith in God and the desire to make the world a better place. Every year, the Kol Israel Foundation and Jewish Federation of Cleveland partner to host a fall memorial for victims of the Holocaust at Zion Memorial Park in Bedford Heights. This year’s memorial will be held from 2 to 4 p.m. Oct. 9. The event serves as a way to commemorate the lives lost and the communities that were destroyed during the Holocaust. Rabbi Matthew J. Eisenberg of Temple Israel Ner Tamid in Mayfield Heights will deliver this year’s keynote address. Memorial candles will be lit by Holocaust survivors, second-generation and third-generation survivors. For more information or to view a list of upcoming Kol Israel events, visit kifcle.org.